A set of five, reclaimed, painted pitch pine internal plank doors with original iron door hardwear. Each door comprises of 3 large planks that have ledges on the back face. The doors have Gothic style handles and door straps on the ledges plus heart detailing on the latches. There is one reciever. The doors are of differing sizes, details below, and are sturdy and well constructed. The doors have a white painted finish. There are decorative blacksmith nails, visible on the front face, to secure the ledges. The doors are reclaimed and therefore have some slight signs of cosmetic wear. There are some scratches, knocks (especially to the edges), chips and marks. The doors have some small dents in the wood. Very small patches of surface rust can be seen on the door hardwear and some paint residue. The doors are ideal for a house rennovation project and have a rustic / country feel. The doors could be stripped and refinished by purchaser to suit. 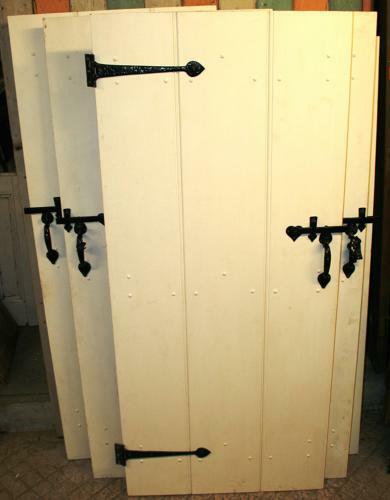 A stylish and desireable set of doors that would be perfect for a cottage or barn style home.